Money-saving combo includes a gallon and a full 20 oz.! 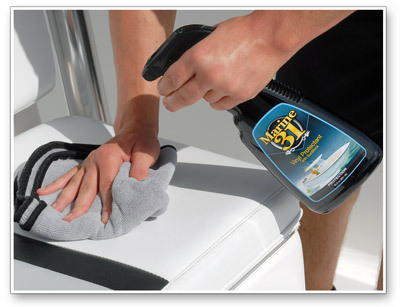 Marine 31 Vinyl Protectant with SunBlock provides the best UV protection for all exterior and interior marine vinyl surfaces including bimini tops and seat cushions. Formulated using SunBlock technology � a fusion of Marine 31�s proprietary UV absorbers and advanced Ciba Tinuvin UV Blockers � treated surfaces will retain their color and texture while repelling dirt, dust, body oils and grease. This silicone-free formula ensures no surface is left slippery or sticky. And wipe off using a microfiber towel. Treated surfaces will be left with a like-new finish that isn't greasy, sticky or slippery. Marine 31 Vinyl Protectant with SunBlock is arguably the most versatile UV protectant available. Marine 31 Vinyl Protecant with SunBlock forgoes inexpensive silicones and petroleum distillates and instead relies on smart chemistry to provide the best UV protection for all exterior and interior marine vinyl surfaces. 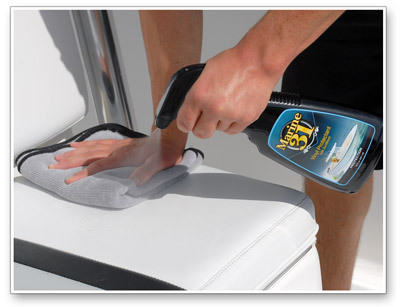 Regular application on your boat cover, bimini top, and seat cushions will help them retain their color and texture. Application is as simple as spraying on and wiping off! Best of all, treated surfaces will be left with a clean, smooth appearance � no sticky, greasy mess! The secret to the durable UV protection provided by Marine 31 Vinyl Protectant is SunBlock technology. SunBlock technology is a fusion of Marine 31�s proprietary UV absorbers and advanced Ciba Tinuvin UV Blockers that are designed to prevent drying, cracking and fading caused by overexposure to the sun. Marine 31 Vinyl Protectant with SunBlock provides the best UV protection of any marine vinyl protectant available. Marine 31 Vinyl Protectant with SunBlock works exceptionally well for restoring the original appearance to sun-faded vinyl, rubber, and plastic surfaces. Treated surfaces will retain their color and texture as long as you regularly apply Marine 31 Vinyl Protectant with SunBlock. What�s more, surfaces that are treated will require less upkeep, staying cleaner in between regular applications. Marine 31 Vinly Protectant with SunBlock is harbor-safe and eco-friendly. Once clean and dry, ensure surface is cool to the touch. Shake well and spray product directly onto surface or applicator. Massage product into surface using a circular motion. Remove excess by lightly buffing with a microfiber towel. Apply monthly for maximum protection. Marine 31 Detailer�s Boat Care Kit Free Bonus!